This Sterling Silver suite features a Caribbean Blue Topaz, Lab Tanzanite, and White Sapphires set, including a Pendant, Ring and Earrings. The pendant (MSP26633W/GBT/TZ) includes an 4.3ctw Square Stone and a .40ctw Lab Tanzanite. The earrings (MSE26633W/GBT/TZ) include an 1.5ctw Square Stone and a .11ctw Lab Tanzanite in each earring. The ring (MSR2663W/GBT/TZ) includes an 4.3ctw Square Stone and a .40ctw Lab Tanzanite. 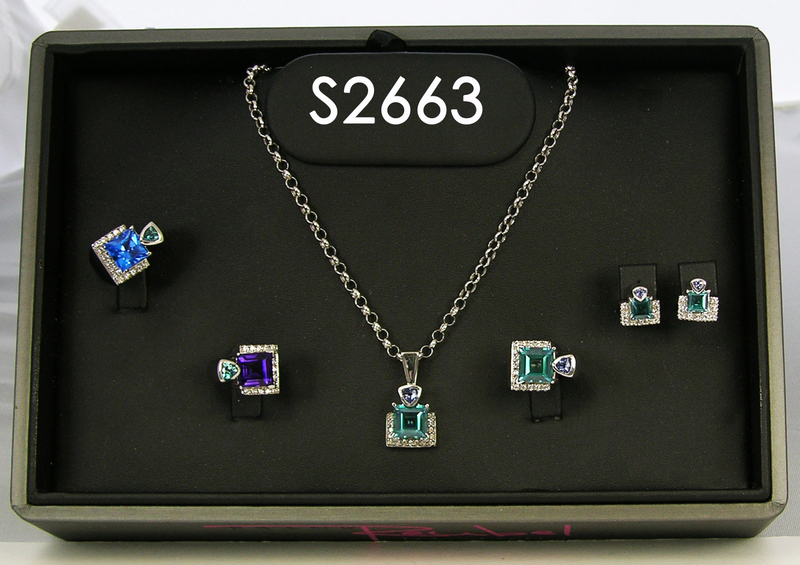 The additional set shows the set in Caribbean Blue Topaz and also additional rings in Kashmir Blue Topaz with Caribbean Blue Topaz, and Amethyst with Caribbean Blue Topaz, a Frank Reubel Designs Signature Stone.